With the Major League Baseball playoffs down to four teams and the Braves not being one of them, I have no dog left in the fight. I can only say that I really don't like the Dodgers. Never have, never will. There is one thing about the team that I do like, though. Actually, that I love. Scully, who has been announcing Dodger games since 1950, is easily the greatest baseball announcer that ever lived. In fact, he may be the greatest sports announcer of all time, period. His silky voice and dulcet tones make him the Sinatra of play-by-play announcers, and his vocabulary makes even the most poetic of writers envious. Rarely does he reach for the wrong word, even when that word is no words at all. Following a rally-killing pickoff of shortstop Nick Punto in Game 4 of the NLCS Tuesday night, just as Dodger Stadium was ready to erupt, Scully quipped, "Listen to the crowd now," then went quiet and let the deafening silence speak for itself. That wasn't the first time Scully had let the fans tell the story. When Henry Aaron broke Babe Ruth's home run record in 1974, Scully was on the mic for NBC, and stayed quiet for well over a minute to let the exuberant fans express what they were feeling. But Scully also knows when to talk, and the exact right words to say. "What a marvelous moment for baseball; what a marvelous moment for Atlanta and the state of Georgia; what a marvelous moment for the country and the world. A black man is receiving a standing ovation in the Deep South for breaking a record of an all-time baseball idol. It's a great moment for all of us, and particularly for Henry Aaron. For the first time in a long time, that poker face in Aaron shows the tremendous strain and relief of what it must have been like to live with for the past several months." As much as I hate the Dodgers, I love Scully and his incredible grasp of every detail of a game and the way he paints such a vivid picture. That is an invaluable trait for an announcer in radio, where Scully cut his teeth in the 40s and 50s, but he manages to use that skill even on a TV game, to bring out nuances that the average fan doesn't even think to look for. - He called what many people believe to be the two greatest games ever pitched, in Don Larsen's perfect game during the 1956 World Series, and Sandy Koufax's perfect game in '65, which included the most strikeouts ever in a perfect outing (14). - He was on the mic for Kirk Gibson's dramatic homer to win Game 1 of the '88 World Series, when the nearly crippled body of the aging veteran limped around the bases. - Bill Buckner still hears Scully's call of the most infamous error in baseball history in his sleep, when Mookie Wilson's slow roller to first dribbled through his legs in Game 6 of the 1986 World Series, giving the game, and eventually the series, to the Mets. - He called Bo Jackson's first pitch, 450-foot blast in the 1989 All-Star Game. It was Jackson's first appearance in the Midsummer Classic, and many say his coming out party in baseball. - Baseball history isn't all that's in Scully's diary. Many don't remember he called "The Catch" by Dwight Clark in the 1982 NFC Championship Game, the last second play to defeat the Cowboys and propel the 49ers into the Super Bowl, which they went on to win. - The 1953 World Series. The series itself wasn't anything exceptionally memorable, but Scully had to step in for Red Barber when Barber had a contract dispute. Scully was only 25-years-old at the time, making him the youngest man to ever announce a World Series (a record that still stands to this day). Barber left the team the next season, and Scully's fate was sealed as a lifetime Dodger. 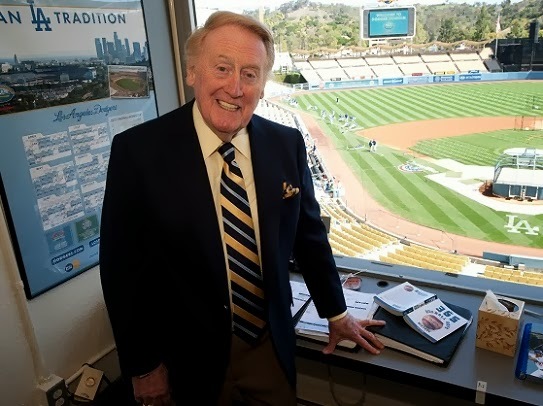 Scully announced in August that he would return next season for an incredible 65th year with the organization, the longest by any announcer with one team. That will also tie him with Tommy Lasorda for the longest tenure in club history. Here's hoping that Scully breaks that record by coming back in 2015. My uncle loved him when he was alive. Truly one of the best announcers and a great guy. So many great announcers through the years. Hard to pick the best, but Scully is definitely one of the best to ever do it. Nice post. Living legend. So many memorable calls through the years. Impossible to pick a favorite. One thing I LOVE about Vin is that he isn't biased. He calls the game as neutral as possible and never bad mouths a player or coach, not even the opposition. He is the epitome of classy. Nice post, Keith! He is a legend of our time. From the opening line of "It's time for Dodgers Baseball" all the way through to the bottom of the 9th.... pure class.